Rockstar Energy Drink is a ubiquitous stalwart of the energy drink market. Sold at most supermarkets and gas stations, it’s difficult not to find it somewhere. So with that being said I decided it was time to review something long past due. My local grocery store provided a convenient cooler of already chilled cans, so I made the purchase and set out to do a thorough review. “Double strength, Double Size.” That statement is located on the front of the can. I’m unsure if the concoction itself is double strength, or if it’s double strength because there is twice as much product in this can as there is in the typical 8 oz. bottle. The world may never know. So I scan the rest of the label to see if there is anything important that I can impart to the reader. 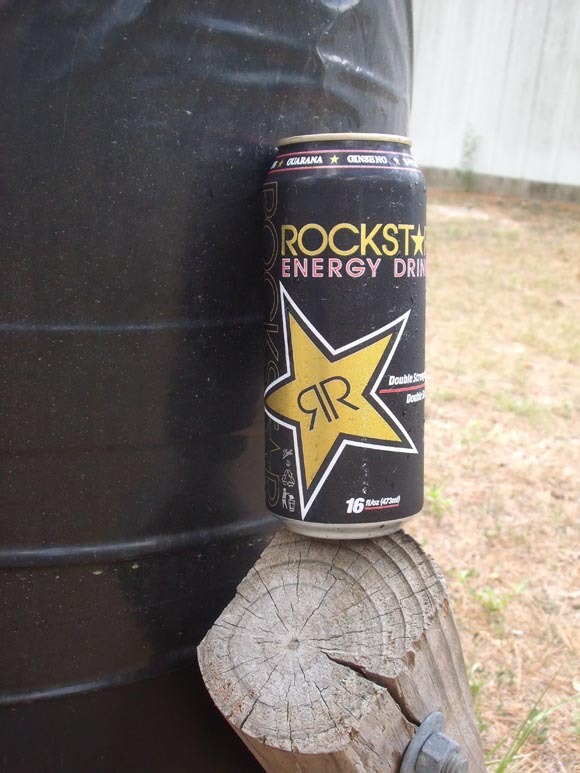 A long and meandering explanation of Rockstar energy drink tells me: “Bigger. Better. Faster. Stronger. ROCKSTAR is the world’s most powerful energy drink.” It went on after that but I have no interest in what it says to be honest. Next I look at the ingredients list. Loads of sugar, caffeine, and B vitamins seem to be the main ingredients in Rockstar. These ingredients aren’t unusual for an energy drink, and the irony of these common and mundane ingredients existing inside a can that claims to “Better” is more than apparent. From my experience the aforementioned ingredients typically provide for a less-than-stellar taste. So with that in mind, the only thing I can hope for at this point is something unique and possibly decent. The top has been cracked. No discernible smell is present, which is good. So I take a gulp. It tastes like cheap lemon-lime and leaves a stout after taste. I take another sip. The taste is mediocre at best and seems to be mostly bland with little complexity. The aftertaste is disagreeable to me and lingers far longer than it should. This may be due to the HFCS used, either way it sours my opinion of Rockstar as a whole. So I take one more sip to be sure. Yep, the same mediocre taste remains and leaves an aftertaste that lingers in the mouth like a bad over-the-counter antacid. Also of note, I don’t seem to have any more energy than before initiating my Rockstar experience. The only feeling I have now is one of profound disappointment. Final review: Do not buy! Much like any number of Canadian musical acts, Rockstar Energy Drink isn’t horrible, but does leave a lot to be desired.